We have already looked at the leptons in part 1, so now we’re moving on to the hadrons. Please don’t forget that I’m keeping this purposefully simple and hopefully jargon-free(ish) to give the greatest degree of accessibility, to as wide an audience as possible. A beginners guide to the Hadrons. So ….what the hell is a hadron? This a question many people ask but few find a satisfactorily simple answer to. Simply put, a hadron is a composite subatomic particles made up of quarks and gluons. We’ll look at quarks in a little more detail further on in this post but for now we can just think of them as little building blocks. As for gluons, we’ll be looking at them in a future post (probably ‘More Soup – part 3’) but temporarily, just think of them as the force that binds the quarks together. This a somewhat simplistic view but suits our purposes for now. Hadrons can be grouped into two main types. The mesons, that are made up of a quark and an antiquark, and the baryons, that are composed of three quarks. To put this into a little bit of context lets use some examples. Some of the best and most commonly known baryons (a type of hadron) are the proton (p) and neutron (n) found in the atomic nuclei. Both of these particles are stable when found in the nucleus. 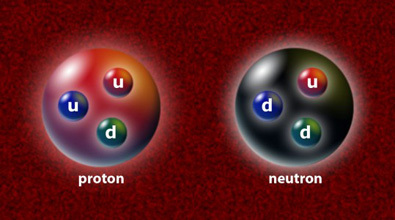 The neutron is unstable when outside of the nucleus (called a free neutron) and decays into a proton via the emission of an electron and an antineutrino. The mesons, however, are a different kettle of fish! Tending to be very short lived, with durations of 10-8 secs and shorter, the most common of the mesons are the Pion (pi-meson) and the Kaon (k-meson). There are many other varieties of meson, including the rho, B zero and eta-c meson but unlike the pion and kaon, these three, and most other mesons, are only detectable by the products of their decay. What does this mean in real terms? Well ….. they are so short lived (10-23 secs in the case of eta-c) that the only way we can “see” them is to look for the ‘things’ they break down into when they decay into more stable products. It the case of eta-c (the charmed eta meson or ηc) the products could be a pair of photons or a trio of pions. 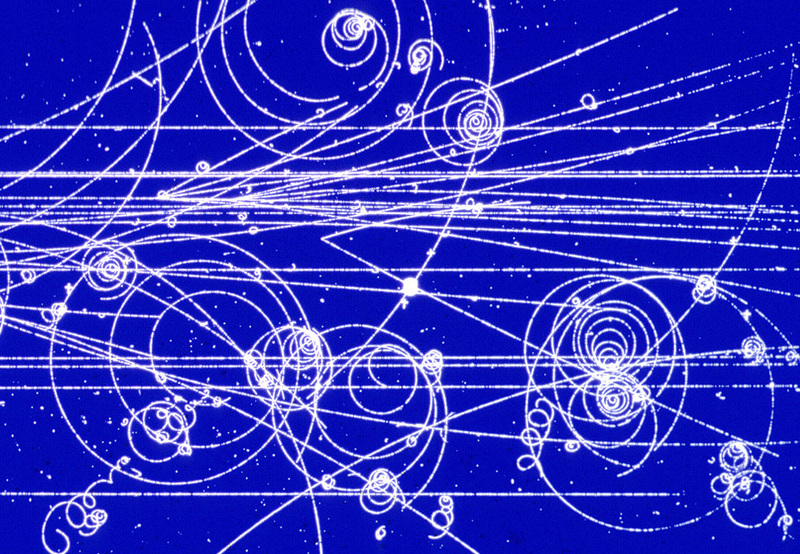 Pion decay in an early bubble chamber at CERN. Like the leptons that we have looked at before, both the baryons and mesons have antiparticles that correspond to each positive particle. The proton (p) has an antiproton ( p ) and the positive pion (π+) has the negative pion (π–) as an antiparticle. However, there are some mesons, such as the neutral pion (π0), that are there own antiparticle! Quite unlike the leptons mentioned previously, all hadrons are affected by the strong interaction as well as the weak interaction, electromagnetism and gravitation. This is an important difference as it is this strong interaction that holds the nucleus together. Were it not so, why would the two protons in a helium nucleus stay together? The force of electrostatic repulsion would surely push them apart at a high velocity! We shall return to these binding forces in later posts. So now we know what a hadron is, well …. we have a better idea anyway. They are two or three of these little quark ‘building blocks’ stuck together. Great. Quarks however …..erm ….. ok, off we go again. Realistically, the quarks really deserve a whole “More Soup” post all to themselves, but what the hell, lets keep it simple and give you a quick guide now. A quick guide to quarks. As we’ve seen, these little guys are the very very simplest things that matter can be comprised of. They are held together in threes (baryons) or twos (mesons) and are a fundamental particle i.e. they’re not made of anything simpler – well thats what physicists currently think anyway. Just like the leptons, they are categorised into six types or ‘flavours’, arranged into three generations. As before, each of these quarks has its own antiparticle – an antiquark e.g. the anti top quark (t) or the anti strange quark (s). Note – All anti particles are designated with a little bar above the letter. An example of some hadrons with their component quarks are listed below. Before we leave this article, there are plenty of physicists out there who will be yelling about various qualities such as spin (isospin), parity (both C and G), strangeness, charm, charge, baryonic number and colour that can also apply to hadrons. For you guys and gals – don’t worry. We’re taking this subatomic soup stuff a little at a time don’t forget. All those attributes will come up again later, in the future ‘More Soup (part 5) – Everything Else!’ post (probably).